Lents, Newton, and Holshue talk business in their new space on Sisson street. 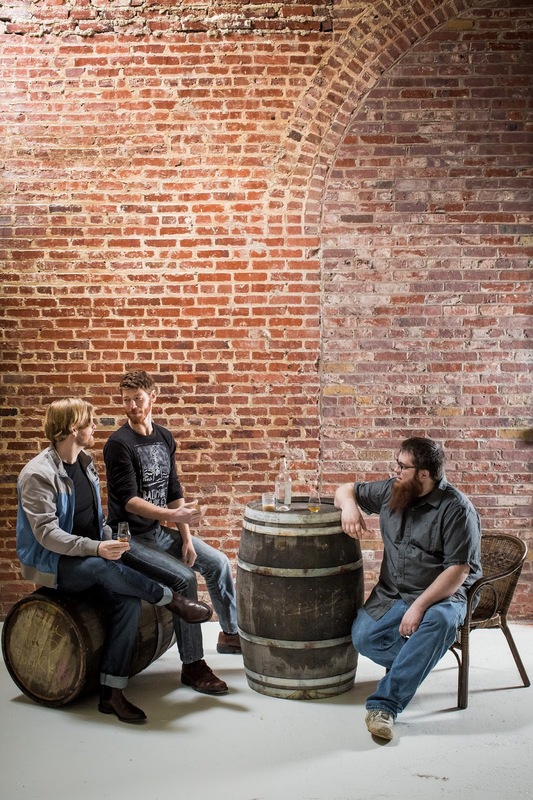 Rye whiskey is a Maryland tradition, one that will be alive again just across Sisson street in the coming weeks. The Baltimore Whiskey Company (BWC) is setting up its distillery now on the lower level of the old Broom Machine Factory building on Sisson Street, underneath Mill Valley General Store. “The original plan was hatched 18 months ago maybe,” says co-owner Max Lents. Lents grew up in Houston, and has been working in the service and retail industries in Baltimore for 8 years. He considered opening a bar, but that morphed into a distillery in conversations with now-business-partner Ian Newton, a childhood friend. The idea “just took,” Lents says. “It went from dream to reality very quickly.” They brought in Jake Holshue from Montana, where he was head distiller for Trailhead Spirits. All three now live in Baltimore City. In the meantime, BWC will produce another traditional Maryland spirit, apple brandy, along with a ginger-apple liqueur based on that brandy, regular and barrel-aged gins, and a young rye cream liqueur. The 4,200-sq-ft space, in addition to the whiskey-making equipment, will be decorated with work from local artists, and the owners hope for a gallery vibe. But it will not feature a public hangout space. “It’s not a bar,” Lents says. However, BWC will be open to visitors at certain hours offering factory tours, limited tastings, and limited on-site bottle sales.